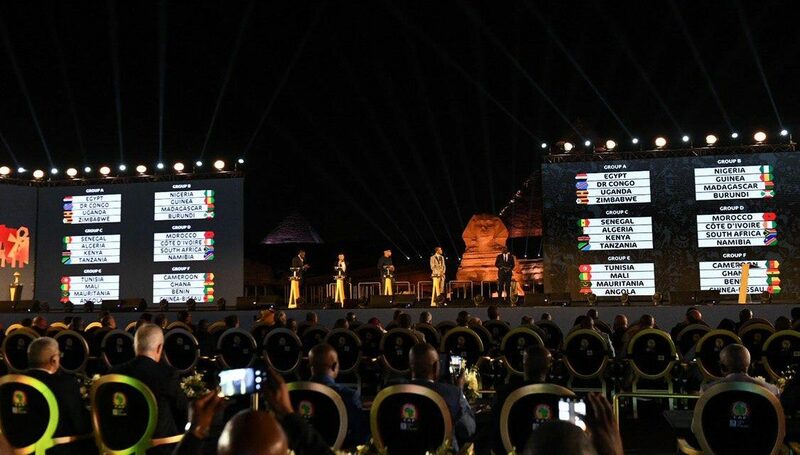 The full draw of the 2019 Africa Cup of Nations finals was completed in the shadow of the Pyramids of Giza, Cairo on Friday, with 24 teams set for action. Hosts Egypt placed in Group A alongside DR Congo, Uganda and Zimbabwe. Egypt will open the tournament against Zimbabwe. Defending champions Cameroon will take on Ghana, Benin and Guinea-Bissau in Group F.
The 32nd edition of the Africa Cup of Nations is set to kick off on June 21 and, for the first time in afcon history, 24 teams will be taking part. The top two teams from each group will go into the last 16, with the four best third-placed teams also progressing. The six venues were named in February across five cities for the new 24 teams tournament to be played between 21 June – 19 July. The full list of stadiums are Cairo International Stadium, Air Force Stadium, Port Said Stadium, Ismailia Stadium, Suez Sports Stadium and, the Alexandra Stadium. The Confederation of African Football announced Egypt as host early January after Cameroon were stripped of hosting rights due to delays over their preparations for the tournament.